Chlorite: Chlorite from Quebec, Canada. This specimen is approximately 3 inches (7.6 centimeters) across. "Chlorite" is the name of a group of common sheet silicate minerals that form during the early stages of metamorphism. Most chlorite minerals are green in color, have a foliated appearance, perfect cleavage, and an oily to soapy feel. 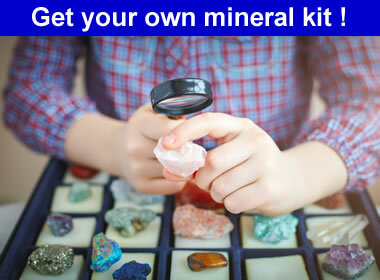 They are found in igneous, metamorphic and sedimentary rocks. Chlorite minerals are found in rocks altered during deep burial, plate collisions, hydrothermal activity, or contact metamorphism. They are also found as retrograde minerals in igneous and metamorphic rocks that have been weathered. Rocks that commonly contain abundant chlorite include greenschist, phyllite, chlorite schist, and greenstone. Chlorite minerals have a generalized chemical composition of (X,Y)4-6(Si,Al)4O10(OH,O)8. The "X" and "Y" in the formula represent ions, which might include: Fe+2, Fe+3, Mg+2, Mn+2, Ni+2, Zn+2, Al+3, Li+1, or Ti+4. The composition and physical properties of chlorites vary as these ions substitute for one another in solid solution. The most common chlorite minerals are clinochlore, pennantite, and chamosite. A more comprehensive list of chlorite minerals and their chemical compositions is shown in the green table on this page. Chlorite: A side view of chlorite showing its foliated appearance. Specimen is from Quebec, Canada and is approximately 3 inches (7.6 centimeters) across. Chlorite minerals most often form in rock environments where minerals are altered by heat, pressure, and chemical activity. These generally have a temperature less than a few hundred degrees and are within a few miles of Earth's surface. Chlorite minerals often form in clay-rich sedimentary rocks that are buried in deep sedimentary basins or subjected to regional metamorphism at a convergent plate boundary. Chlorite that forms here is usually associated with biotite, muscovite, garnet, staurolite, andalusite, or cordierite. 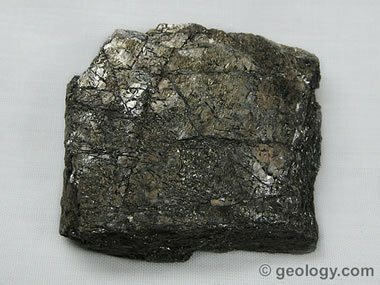 Metamorphic rocks rich in chlorite might include phyllite and chlorite schist. Another environment of chlorite mineral formation is in oceanic crust descending into subduction zones. Here, amphiboles, pyroxenes, and micas are altered into chlorite. 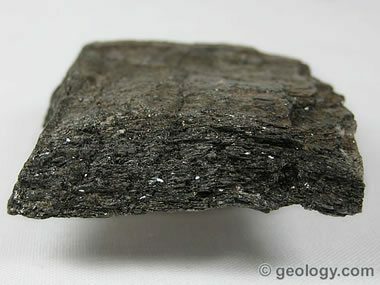 Chlorite minerals also form during the hydrothermal, metasomatic, or contact metamorphism. These chlorite minerals are often found in fractures, solution cavities, or the vesicles of igneous rocks. The "X" and "Y" in the formula represent ions, which might include: Fe+2, Fe+3, Mg+2, Mn+2, Ni+2, Zn+2, Al+3, Li+1, or Ti+4. The composition and physical properties of chlorites vary as these ions substitute for one another in solid solution. Uses Very few industrial uses. Used as a filler and as a constituent of clay. Members of the chlorite mineral group are typically green in color, have a foliated appearance, perfect cleavage, and an oily or soapy feel. Their variable chemical composition gives them a range of hardness and specific gravity. This makes them difficult to differentiate in hand specimen. Recognizing a mineral as a member of the chlorite group is usually easy. However, placing a specific name on it can be difficult. Detailed optical, chemical, or x-ray analysis is usually required for positive identification. The name "chlorite" is often used in classrooms and the field because the minerals are difficult or impossible to identify. As a result, the individual chlorite minerals are poorly known. Chlorite is a mineral with a low potential for industrial use. It does not have physical properties that make it suited for a particular use, and it does not contain constituents that make it a target of mining. When found, chlorite is usually intimately intermixed with other minerals, and the cost of separation would be high. As a result, chlorite is not mined and processed for any specific use. Its major use is as a coincidental constituient in crushed stone.